We decided to go exploring and stopped at the McDonald’s on the way. (Intrepid, aren’t we?- Lee) I love their iced tea, it’s cheap and tastes great, and I took in a half-gallon decanter to ask how much it would cost to fill it. The thought being I could keep it in the camper fridge for a cheap beverage. The manager only charged me $1 stating they had free refills. Say what you want about McDonald’s but they are consistent, and generally the staff understands customer service. Next stop, Big Lots to look for a cheap mattress fix. I worked for Consolidated Stores for 7 years when the kids were young and they are a great company, filling a need for a low-cost alternative for many people. They often carry name brands at really low prices so I thought, why not give it a shot? They had a 3″ egg crate foam pad which was exactly what I thought would solve the problem. I should note here Lee said all along this would not work. The saleslady was very helpful and we got to feel the foam but I quickly saw Lee was right (drat!!) and it was too thin. We bought some other miscellaneous stuff (100 bamboo skewers for $1.50) and headed on our way. Mattress problem not solved but more information in hand. As we came out of the Big Lots we saw a sign for the Saugerties farmer’s market. One of my ideas is to get local produce at the farmer’s market and try to incorporate it into that night’s meal. It was very nice, although small, with a cool selection, and we bought a few things including a tiny jar of local honey. Someone I work with told me that the natural cure to allergies was to buy local honey. The idea is that because it is made of local nectar it would provide some immunity. I took a teaspoon (it was raw honey and tasted incredibly good) thinking even if it doesn’t work I got a nice treat out of the deal. I have to say it did seem to work. My nose was much clearer although after about 5 hours I had to take another spoonful (no hardship there). Personally I am sold and will try this wherever we visit. Since Roadside America was such a hit yesterday we decided to try it again, but in the interest of “Get off the interstate Ben Stone” (Doc Hollywood reference – great movie) we took a detour to a nearby historical lighthouse. The lighthouse was a loooong walk down a semi-shaded path, but at the end there was a lighthouse that also serves as a B&B. Pretty neat if a person likes to stay in historical places. Back on our path we passed by a rocket in the front someone’s yard. Wouldn’t go far out of my way to see it but it was very close to the Catamount People’s Museum which I really wanted to see. 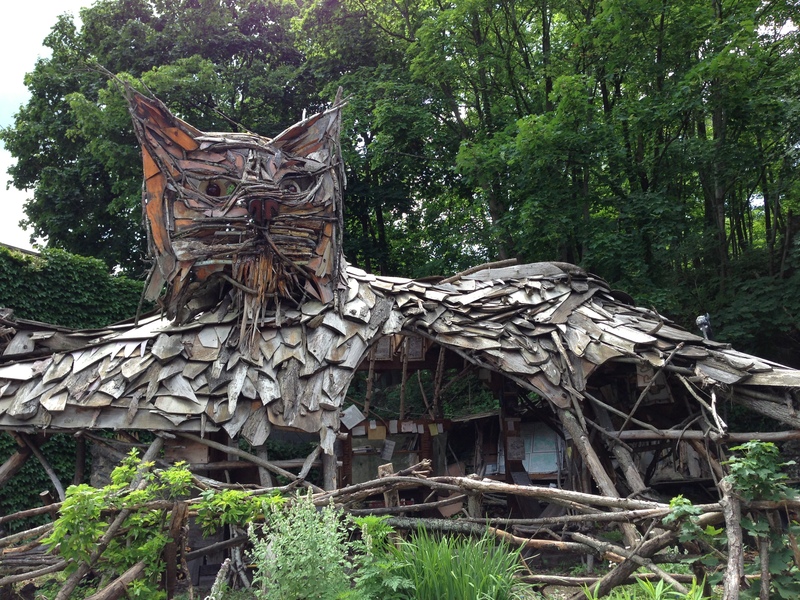 The Catamount People’s Museum is a very cool sculpture shaped like a giant bobcat made on a vacant lot out of natural materials, right in the middle of town. I thought it was great, although it seems from the literature it’s a constant struggle not to have it torn down by the city. We stopped for a few minutes and took some pictures and then off we went to our next adventure. I should probably mention here that it sounds like we were “drive by’ing” and to some extent we were. I have perfected this skill (learned from my mom) of getting out, seeing something, and moving on. I will say though that it is important to mix in really spending some time at a place if it’s interesting, but you can pack a lot in a day if you stop, take a picture, and move on. Figuring out when to stay and when to do a quick stop has been a delicate marriage negotiation over the years, but I think in generally we have come to a healthy compromise. Finally, we wanted to see Woodstock. I am not particularly interested in that piece of history, but it was right there, so we drove through. Woodstock was packed. It’s a funky little town with a lot of new age shops and aging hippies everywhere (no offense to those aging hippies out there… good for you for sticking to your guns). It just wasn’t our scene, so we slowly drove through town and then had lunch at a little Chinese place outside of town. I just wasn’t in the mood to fight the crowds, plus we had decided to do some streamlining in our camper. We initially over packed the camper. Not surprising, because we didn’t know what we would need and we finally both felt ready to get rid of all the excess. It required some delicate maneuvering for us both to work in the small space, but we covered the dining room table with “extras” to go back home and reorganized the cabinets. I definitely recommend this activity after a few camping trips, because most things now have a permanent home and we freed up a lot of space for anything additional we wanted to add in the future. I like having some open cabinet space just in case and truly there is plenty of it after the rearranging. 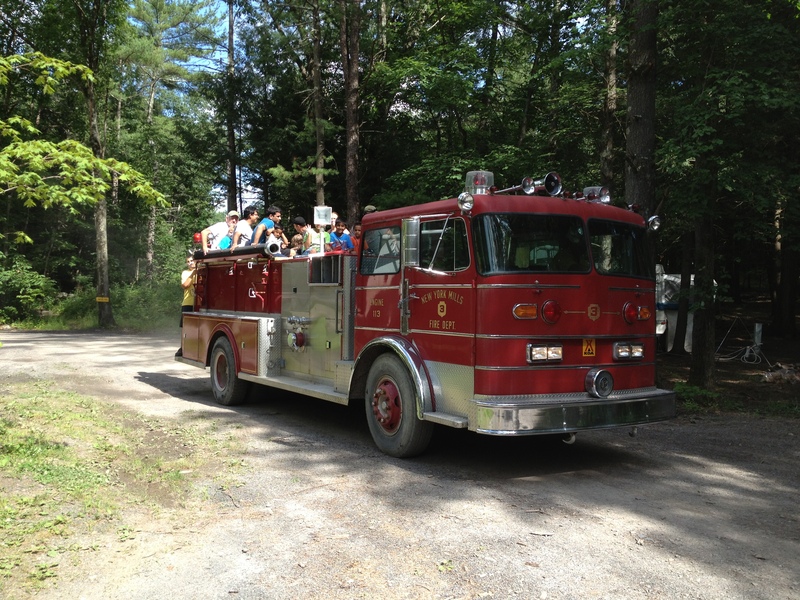 One nice thing I wanted to mention about the campground Saugerties KOA is at 4pm on Saturday they have a fire truck rides for the kids (and several Dad’s). It was a nice extra and everyone on board looked like they were having a great time. Finally it was time for dinner and I wanted to try a new recipe… pizza on the campfire! Honestly I was dubious that it would work out but it looked fun and challenging. The pizza turned out great!!! Lee loved it and said it tasted just like fancy, artisan pizza. This made me pretty happy because I am only having about a 50% success rate on the new recipes I try and I haven’t hit a home run since that first fish dinner we had. Anyway, this recipe tastes great, and is fun to make (kids would love getting to make their own custom pizza) so please see the recipe below and give it a try. This entry was posted in Uncategorized and tagged allergies, Big Lots, camper mattress, camping, Catamount People's Museum, Catskill Mountains, Fourth of July Camping, Holiday Camping, honey, mcdonalds, Roadside America, Saugerties, Saugerties KOA, Woodstock. Bookmark the permalink.